It’s SAL update time again. This is how far I’d got for the last update. 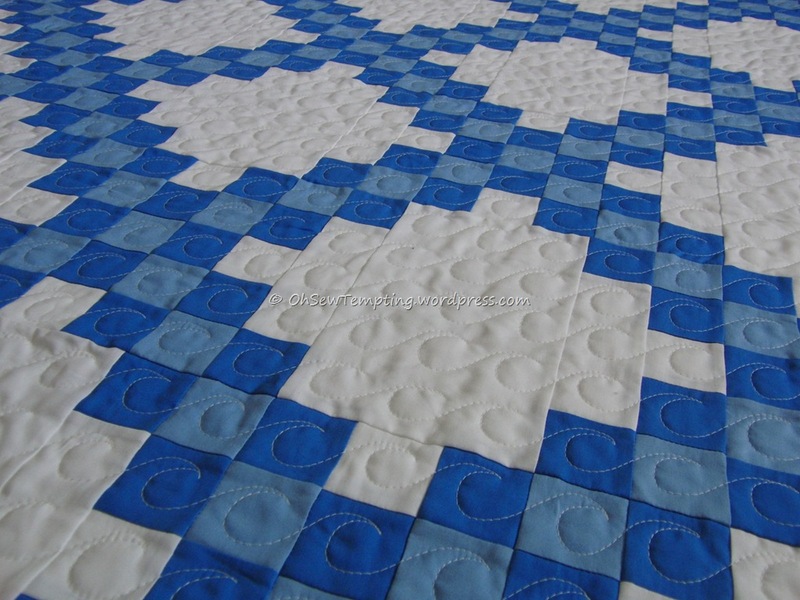 There is one difference in addition to the back stitching. Can you spot it? 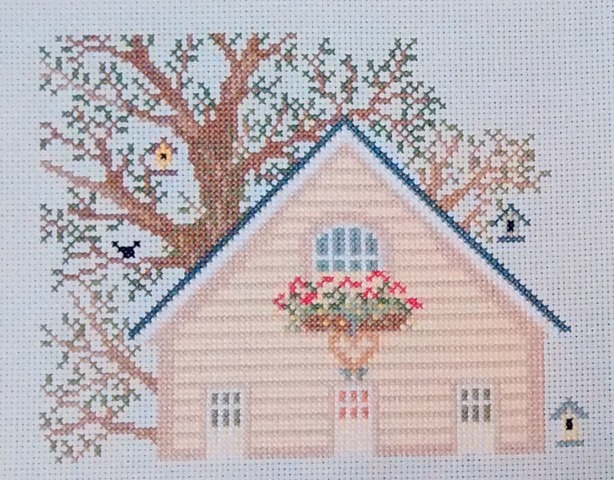 I’ve really enjoyed stitching this one. The back stitch on the jacket was a bit of a nightmare but the rest was a dream! The thread colours are so rich in real life and the quality of the kit was first class. I did have to enlarge the chart by 100% so I could work from it but that was easy enough to do. The kit is from the James Herriott Collection. 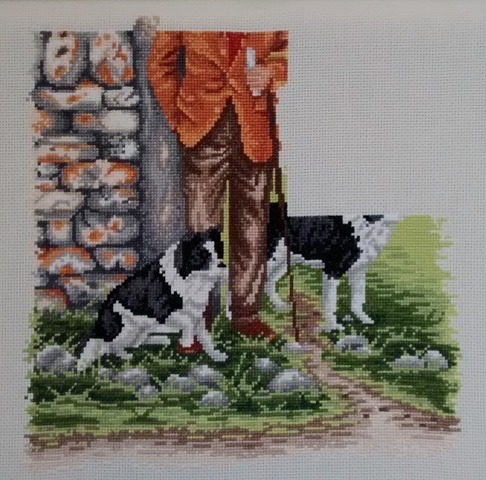 There are lots of others in the set depicting Border Collies and farm animals. 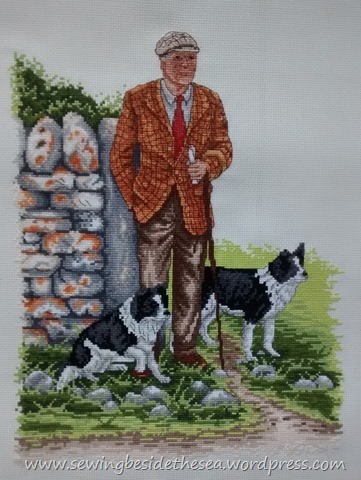 The finished piece has now been gifted to a dear friend who originally gave me the kit as part of her cross stitch clear out. She can no longer see well enough to do cross stitch herself and has admired the progress of my stitching over the last few months. It seemed like the perfect gift to return it to her all finished, particularly as she has a special birthday coming up soon. One of the best bits about finishing a project is that I can start another one. 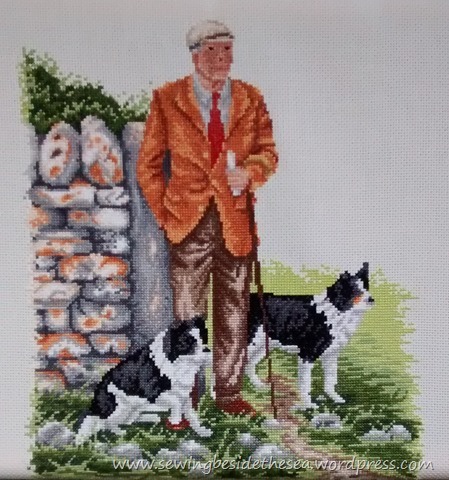 This time, me and Claire will be stitching the same thing but in different colours. My OH bought me this chart over a year ago from The Crafty Kitten. This is the third design I’ve stitched by Ink Circles. It’s called Cirques des Triangles. The other two are Cirque des Cercles and Cirque des Coeurs. 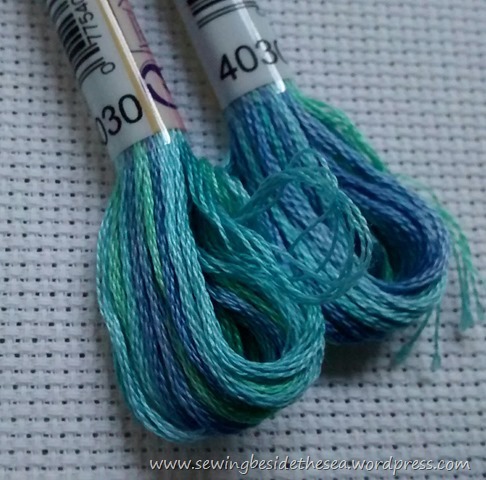 I’ve chosen to stitch with a turquoise and sea green variegated thread (DMC 4030) on white 16 count aida fabric. I look forward to sharing progress next time. Our next updates will be posted on the 19th February 2017. See you then! I hope you are enjoying a lovely, relaxing, crafting Sunday. 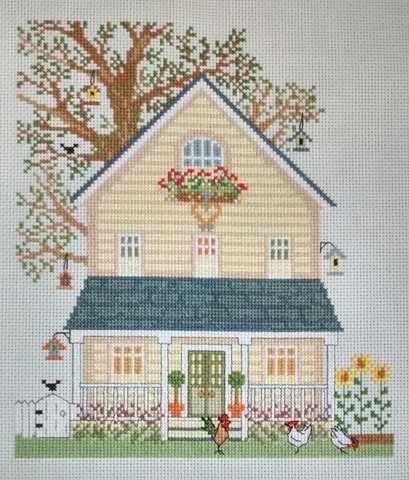 I’m so excited because I’ve just finished the 3rd New England House. This has been such a quick design to stitch by Bothy Threads. 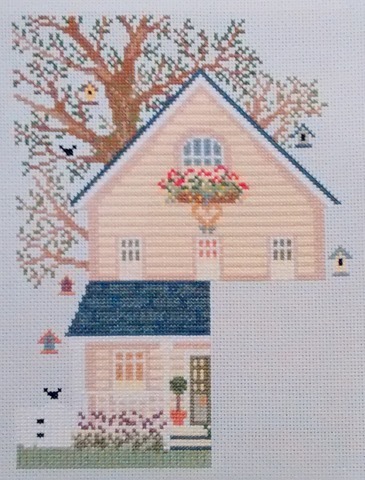 Here’s how it grew, quarter by quarter, and the final photo also includes all the back stitched details. Eagle-eyed readers will notice that the bottom left bird box moved between the 4th and 5th photos. 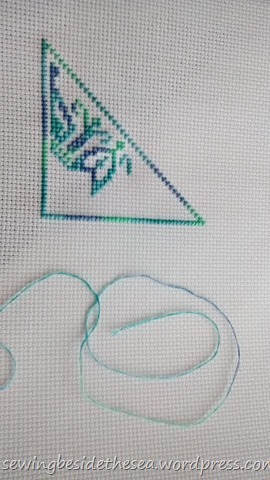 It wasn’t until I did the backstitch that I realised I’d stitched the box in the wrong place so it had to be unpicked and stitched again. That’s three down and one to go so I hope my sister hasn’t been out shopping for frames yet. It would be nice to have Winter stitched up quickly and then she can display them all together. There’s a lot of white stitching on the Winter design plus some shiny thread and a few beads so it could take longer than this one to finish. 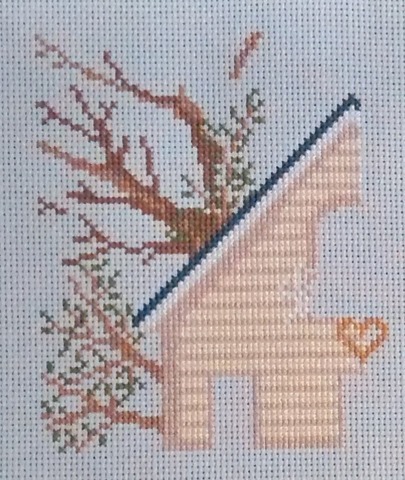 This is actually my second cross stitch finish of the year so far. I can’t show you the first one until 29th January because it’s my SAL project and we only update every three weeks. I put the finishing touches to it yesterday. There’s plenty of cross stitch Happy Dancing going on here. I wish I could say the same for patchwork. My machine probably thinks I’ve ran away! I can’t remember the last time I switched it on. It’s time to share progress on the SAL project again. This is how far I’d got for the last update. There’s just the back stitch detail to add now. Then I’ll have a finish to share next time. The kit is from the James Herriott Collection. We have two new SAL members joining us this time. 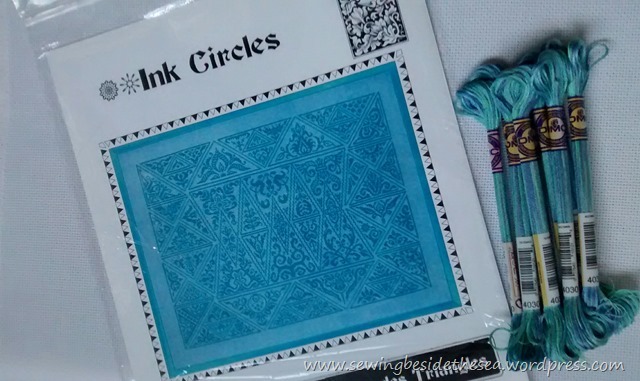 Please welcome Linda and Catherine who both have some lovely projects on their blogs. I’m also pleased to announce that Wendy has returned to the SAL after a short break. Grab a cuppa and take a look at how everyone else is progressing. Just click on the names below and you’ll hop over to their blogs. We live all over the world so you may need to allow for time differences but we post local time, every third Sunday. Our next updates will be posted on the 29th January 2017. This SAL (Stitch Along) is slightly different to other SALs in that we don’t all stitch the same design at the same rate. We choose ONE unfinished project, or maybe ONE new one, and show progress of its completion over a series of three weekly updates. There are no deadlines and no set amount to stitch. The result is that the space in our drawers full of WIPs (works in progress) is gradually being freed up to store lots of new crafty goodness. It’s surprising how much motivation I’ve gained from being in this SAL. If you’d like to finish a project you’ve left unfinished for a while, you can join us by leaving a request in the comments below or sending me an email. The address is on the right of this page. I’ll send you a few simple rules to agree. I hope you’ve all had a lovely time if you celebrate Christmas. 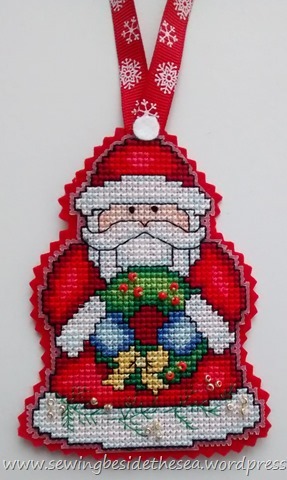 I finished stitching this Santa decoration just in time to add it to my Daughter’s Christmas presents but didn’t have time to share it here. This Santa is one of a set of six in a pack by Design Works. I’ll definitely be making the others when I get time. It’s nice to stitch on plastic canvas sometimes isn’t it? I struggled to decide on the colour of felt backing and ribbon but a couple of crafting friends offered advice and I went with their choices in the end. Best wishes to all for the New Year. Hasn’t 2017 come around quickly? It’s been a very busy three weeks here but I’ve still stitched quite a lot this time. This is how far I’d got for the last update. 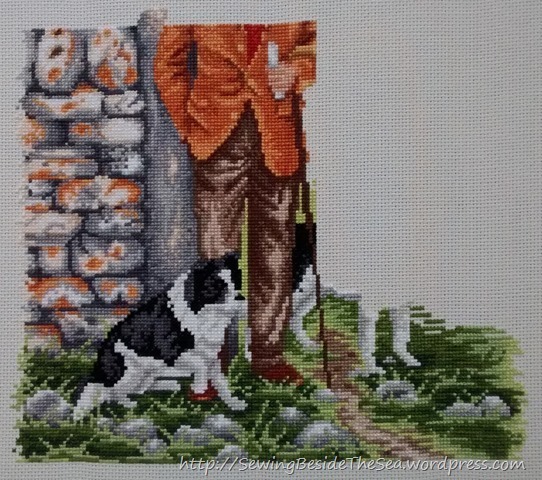 So, that’s the top of the wall and the greenery behind, as well as the rest of the second dog and the background finished. I’ve had to scroll the bottom part around the frame so I could work at the top left, so you’ll have to wait to see it all together at the very end. The way things are going, this project could be finished by the end of January. Steph is our new SAL member this time. I’ve just read a few of her latest posts. She’s up to all sorts! Is there a word meaning more than prolific? Anyway, I can’t wait to see which project she’s chosen for the SAL. Please also take a look to see how everyone else is progressing. Just click on the names below and you’ll hop over to their blogs. We live all over the world so you may need to allow for time differences but we post local time, every third Sunday. Our next update will be posted on the 8th January 2017. Yes, 2017! This SAL (Stitch Along) is slightly different to other SALs in that we don’t all stitch the same design at the same rate. We choose an unfinished project, or maybe a new one, and show progress of its completion over a series of three weekly updates. There are no deadlines and no set amount to stitch. The result is that the space in our drawers full of WIPs (works in progress) is gradually being freed up to store lots of new crafty goodness. It’s surprising how much motivation I’ve gained from being in this SAL. If you’d like to finish a project you’ve left unfinished for a while you can join us by leaving a request in the comments below or sending me an email. The address is on the right of this page. I’ll send you a few simple rules to agree. Here is a progress report on my SAL project. This is how far I’d got in the last update. Here’s where I’m up to now. Can you find the bit I’ve done this time? No? well, it’s all along the very bottom of the picture. Lots of lovely thread changes. There was actually quite a bit of work in this part and all of the foreground is finished now. I’m going to stitch the rest of the dog for next time. Helen is our new SAL member this time. I can’t wait to see what she’s been up to. Please take a look to see how everyone else’s projects are progressing. Just click on the names below and you’ll hop over to their blogs. We live all over the world so you may need to allow for time differences but we post local time, every third Sunday. Our next update will be posted on the 18th December 2016. One week before Santa’s visit! It’s SAL time again. This kit is from the James Herriott Collection and this is how far I’d got in the last update. 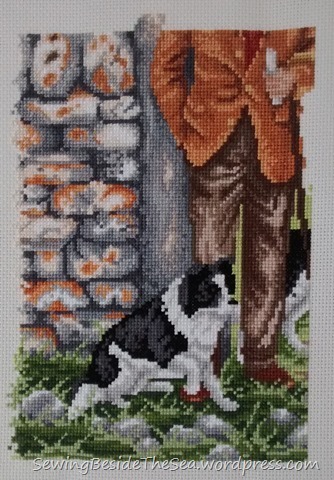 I’d hoped to have finished the second dog for today but it wasn’t to be. Here’s where I’m at now. 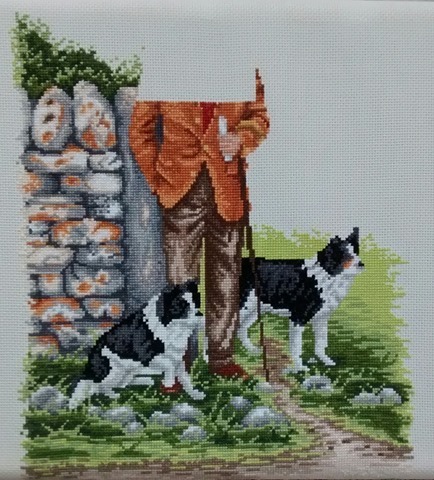 All that remains to be stitched is the top of the wall, the dog handler’s head, shoulder and elbow, the second dog’s head and some more foreground. I’m going to complete the foreground next and then all the other more interesting bits will bring it to life at the end. Cindy is our new SAL member this time. She’s chosen a huge cross stitch project to finish. Don’t forget to take a look to see how everyone else’s projects are progressing. Just click on the names below and you’ll hop over to their blogs. We live all over the world so you may need to allow for time differences but we post local time, every third Sunday. 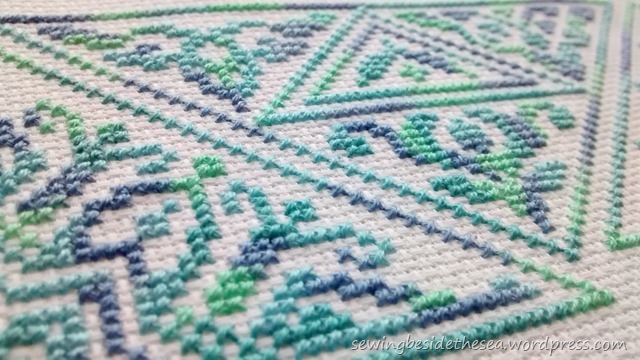 Another three weeks have disappeared and it’s time to show a progress update on my stitch along project. This kit is from the James Herriott Collection and it was given to me by my lovely friend Lin. She was having a clear out and I was a very lucky girl! Anyway, this is where I was up to last time. This is how far I’ve got this time. It won’t get any wider than this. 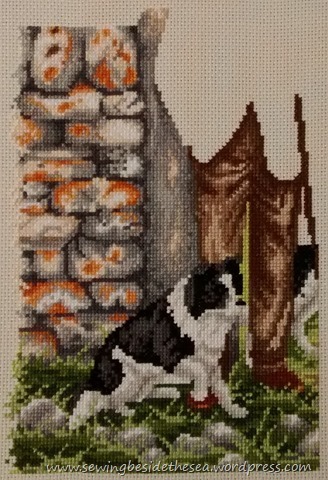 Next time I hope to have the other dog more or less finished. You can see that I’ve already got the legs done. As is usual for me, I’ve changed the pattern! I won’t tell you what I’ve done just yet, in case I want to pull it out, but I’ve made an executive decision and I hope it’ll work. Margaret is our new SAL member this time. Her blog is full of gorgeous hand made items. She’s mastered a whole host of crafts so I’m looking forward to seeing what she’s chosen to make or finish first. Don’t forget to take a look to see how everyone else’s projects are progressing. Just click on the names below and you’ll hop over to their blogs. We live all over the world so you may need to allow for time differences but we post local time, every third Sunday. It’s time for a SAL update today. 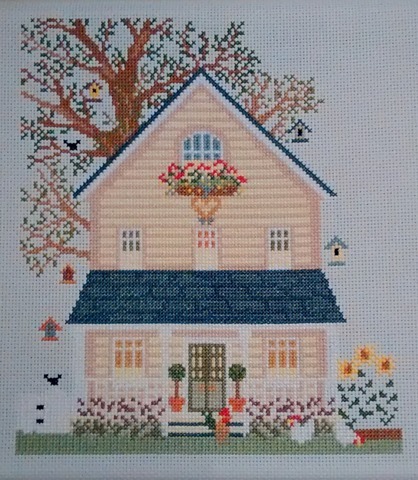 Last time my Next To Go cross stitch looked like this. 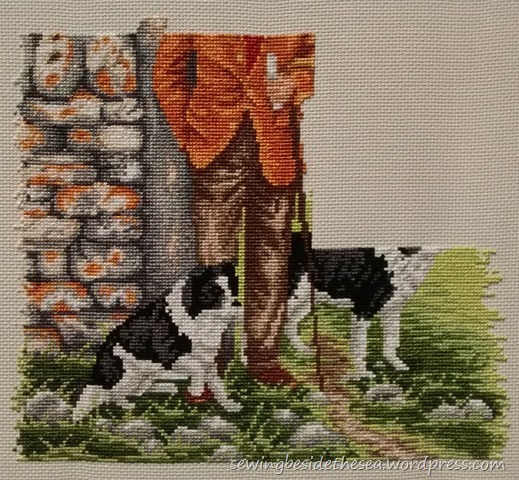 I promised to work on the dog handler’s jacket for this update and I’ve now completed another page of the chart. You’ll have to wait until later for his head and shoulders to appear. Here’s where I’m up to now. The next part will be from the bottom right upwards. There is also more foreground across the bottom of what is already stitched but I’ll just keep going one page at a time. The kit is from the James Herriott Collection. Don’t forget to visit all the other blogs that are members of this SAL. We live all over the world so please allow for local time differences when looking for their updates today. Click the names below to see what they’ve all been up to. There’s something for every taste. If you want to join the group, leave a comment below or send me an email. You’ll find the address at the right of this page. I’ll send you a few very simple rules. Our next update will be on the 16th of October 2016. See you then!